CAMP FURNITURE AND STORAGE? WE'VE GOT THAT TOO. We've been creating the finest Outdoor Cookware since 1985. But we soon realized that unless you like cooking in the dirt and mud, you need quality camp furniture. 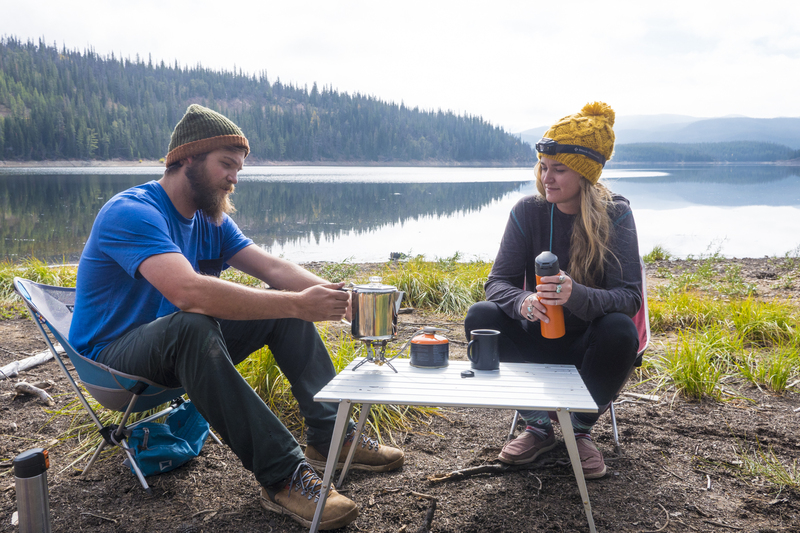 Many campsites are lacking in proper cooking surfaces and there aren't a lot of picnic tables to be found deep in the backcountry - so where does one put their camp stove or wine glass? Not ones to shy away from an engineering challenge, we took our expertise at building light, collapsible gear and applied it to camp tables and storage. Meet the GSI camp furniture. If you wanted a heavy, bulky table that gives you splinters and burns your legs with hot metal screws, you'd pack a picnic table in your backpack. We assumed you want something light, foldable, and packable, yet strong enough to hold your camp cookware and more. Enter the GSI Micro, Macro, and Ultralight tables. All tables boast a sturdy aluminum cooking surface and carrying tote for easy transport. The Micro Table is small collapsible, lightweight platform with legs that adjust for the perfect cooking height. The adjustable Macro Table is the perfect tag-along table for family camping, with a taller height and larger surface for all your food, camp games, lamps, and more. Then come the ultralight tables - when you thought collapsible tables couldn't get more compact. Folding down to 0.6 inches, both the small and large Ultralight Tables slip easily in your backpack, because after a long day on the trail, you don't want to slouch to cook your food on the cold, hard ground. Once you've got your camp table in order, you need to figure out your gear storage. Nothing's worse than digging around in your hatchback or the bottom of your pack because YOU JUST SAW THOSE MATCHES FIVE SECONDS AGO WHERE COULD THEY BE? Keep those little things that slip in between the seats in your Subaru in a watertight, crushproof Lexan Gear Box and you'll never have to unpack and repack your bag to find your camp stove again. Available in Small, Medium, Large, and Extra Large, our Lexan utility boxes lock out water, dirt, and bugs while keeping your gear dry and protected. Toss one in the canoe, stow one in your camper, or keep one in your garage - wherever your trinkets need securing. Water you going to do without a water jug on your camping trip? Bad puns aside, your water needs proper storage too - so we invented the water cube. Foldable, durable, and light aren't typically words associated with water containers. But the 10L, 15L, and 20L Water Cubes are just that. With an integrated handle and ergonomic tap, this water jug makes hydration a breeze. Once it's empty, fold that cube down flat and go. Water you waiting for? We're all about camp cooking, but without the proper furniture and gear storage, making dinner can be a drag. Invest in some tables and storage containers and get your camp stove out of the mud and stop bringing fifteen water bottles on every trip.